The Pensive Pen: Period Ink Guidelines - What were they drawn with? Period Ink Guidelines - What were they drawn with? Recently I've been thinking about period calligraphy guidelines. Not so much as to how they are used, but how they were made. Specifically, I want to know what tool was used to draw the ink lines? This post details my findings so far. Read on if you are into geeky investigation. It's easy to look at period examples to see visible guidelines around the calligraphy. With a stylus or other tool to indent an impression into the parchment. Almost never used on paper, because paper tends to cut or tear. With a metal point drawing implement such as a lead & tin plummet. In this case, a softer metal is used with an abrasive preparation on top of the parchment such as gum sandarac. Small amounts of the metal are ground off and leave a mark on the page. Depending on the type of metal, the lines may tarnish and change color as the piece ages and is exposed to air. The mechanics of using a stylus or plummet against a straightedge are easy to understand and recreate. What I'm trying to determine is what type of pen or tool was used to draw the ink guidelines? It was able to be run against a straightedge to product perfectly straight lines. It left a line of consistent width; sometimes as fine as a quill's hairline, sometimes thicker. A reed or quill might be able to be used against a straightedge. Would they be able to leave a thin consistent line? My curiosity really became peaked when I was recommending the use of a ruling pen to a fellow scribe for its ability to draw an even-width line. If you aren't familiar with it, a draftsman's ruling pen consists of two spring loaded metal arms that come to rounded points. The distance between the arms can be adjusted. Using a brush, you load ink or paint into the gap between the arms. You can draw it against a ruler with both tips touching the paper and it will draw a clean, fixed width line. This is my ruling pen. It's such a simple tool, I thought to myself, "I wonder if there are period ruling pens?" I found the following quote & image in an article titled "The Undisciplined Drawing" by Alessandro Zambelli, in Buildings 2013, 3, 357-379; doi:10.3390/buildings3020357. "For at least two thousand years the principal tool for making permanent lines in technical (and other) drawings has been the ruling pen (Figure 15). Essentially an exposed ink container, relying upon surface tension to retain the draughting fluid, ruling pens are formed by the folding of a single, or the clamping together of a pair of metal leaves, shaped to rest in the hand and gripped between fingers." The image in particular is very exciting to me. The first example is a folded ruling pen, versions of which are favored by modern calligraphers as an expressive writing tool. Used with the pointed tip just touching the page, they can leave a controlled fine line. They are easy to manufacture as well, requiring only a small piece of flat metal to fold into shape and somehow adhere to a handle. The second example is similar to the modern technical ruling pen I pictured earlier, with a sliding adjuster instead of the screw. It would be a little more difficult to make, but allow the creation of lines of different widths. Zambelli's bibliography says that this image comes from Hambly, M. Drawing Instruments 1580–1980; Sotheby’s: New York, NY, 1988; p. 58. 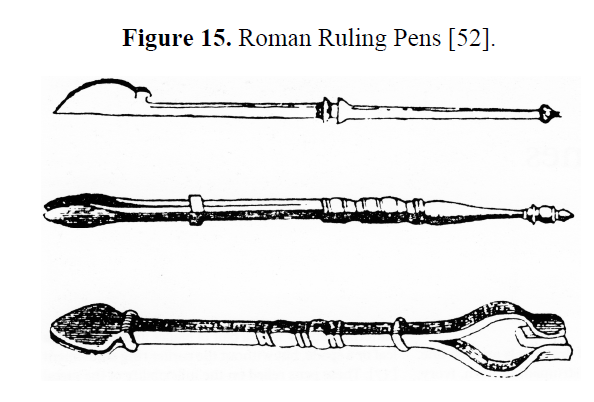 If the image is truly based on medieval extant Roman ruling pens, I have my answer. Unfortunately, I have yet to find this book. And one comment about it indicates that its Bibliography is lacking. As I continued to search, every single reference I found traced back to Hambly... I became worried that perhaps I wasn't going to find any other evidence, and that Hambly's image was based on conjecture, not extant pieces. This metal appears to work similarly to post-period Venetian Glass pens: flutes in the tip create crevasses for the ink to rest, held by surface tension. Ink can then flow down to the pointed writing tip. I wonder if this type of pen would be the correct tool for the job, as the ink would potentially rub off on the straightedge. It also doesn't appear to be able to leave an extremely fine line, though experimentation is needed. Still having no luck finding extant ruling pens, I wondered if perhaps they were incorrectly categorized? The two-pronged ruling pen looks an awful lot like a pair of tweezers. The wide flat tip wouldn't be ideal compared to the rounded tip, but it does have a tension/width adjuster that is detailed in Hambly's image..
"The direct application of ink was achieved with the pen, whose principal feature was a blade which retained some ink. This could be achieved by bending a single piece of metal along its length; an alternative solution which remained current from antiquity to the Renaissance, was to have two blades whose separation was controlled by a ring sliding on the shaft of the pen." Epact also contains images of two late period sets of drawing instruments. They prohibit copying of their images, so please click through to view them. The first image contains devices that could be two-pronged ruling pens, and the details of the record states it contains "a pair of compasses with a small folded blade for ink". The second image contains a device that looks like a metal pointed quill. That is, a metal tube cut at the end at an angle so that it comes to a point. The inside of the tube appears ink stained, making me suspect it was used a a pointed pen. The details of the records states that among the tools are "Compasses, 5 in. with pen-nib. Pen with fixed nib. Drawing pen." After posting my find of the Epact site, Sir Cedric pointed me to this image of a 16th century italian compass set. It is clear to me that one of the attachments to the compass is a ruling pen with a sliding width adjuster. The description of the find calls them tweezers. I ask you: why would you need a set of tweezers attached to your mapping compass? I suppose they could clamp onto something like a piece of chalk to make a mark with, but the rounded shape of the tips and how they come together is that of a ruling pen to me. My investigation is not complete. With Cedric's help, I now have evidence that lining pens existed in the 16th Century. I'd like to find some earlier examples to see what types of lining pen were in consistent use. I'd especially like to see an example of the folded type, as it seems like that ould be easier to manufacture. I plan to experiment as well. I will be testing a quill, a reed pen, my modern lining pen, and maybe a variant of the flanged pen and a home made folded pen. If anyone has read to this point and has links to any other primary source examples of medieval or Renaissance lining pens, please share them with me. Credit will be given!